As You Read These Words, You Are Being Counseled The very word "Counseling" is a turn-off to a lot of people. Yet, all of us are in need of receiving and giving good biblical counseling. You might look at it like this: Preaching may be counseling, but not all counseling is preaching. Counseling is simply the giving and receiving of advice. Do you wish you had someone who would listen to you? O.K. What would you say? Are you a good listener when someone is speaking? Becoming a good listener is a tough discipline that is never completed in any of us. Don't think of counseling as being just for the professionals. You are part of the human race, and you were created to receive and give counsel. The question is to find and follow the right source. You've likely heard the words of Genesis 1:26. They reveal to us that counseling was taking place within the Trinity before the creation of this world. We are the result of The Big Counsel, not the Big Bang Then God said, "Let us make man our own image, after our likeness; and let them have dominion over the fish of the sea and over the birds of the heavens and over the livestock and over all the earth, and over every creeping thing that creeps on the earth." 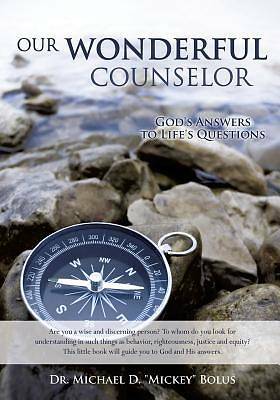 In this little book Dr. Bolus will be sharing with you some of his own counseling experiences from over 50 years of ministry. If you like a good story, we think you will like reading Our Wonderful Counselor.